Yesterday was the last of the four day family trip with Dennis parents and brothers. 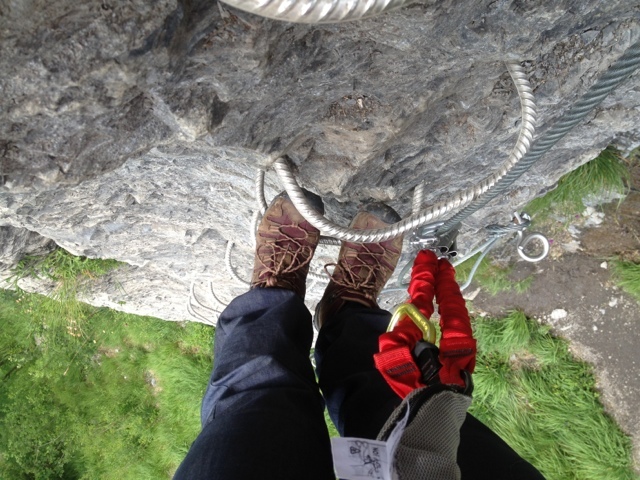 I found a great viaferrata not far from Chamonix "Via Ferrata de Curalla". 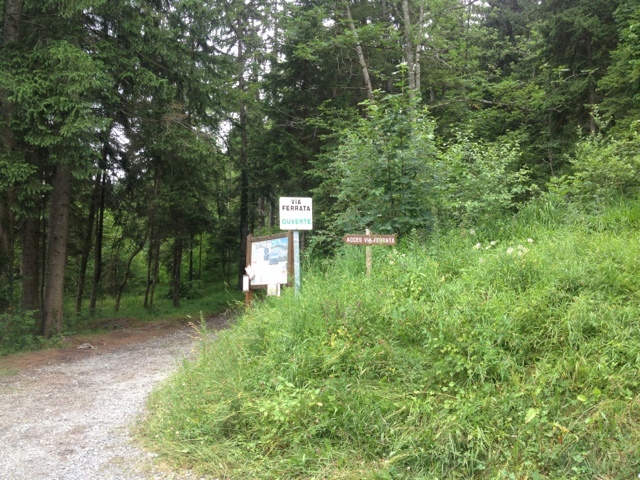 Located on the 'Plateau d'Assy close to the village 'Passy'. The guidebook even stated that it was Europe's best and most beautiful one. 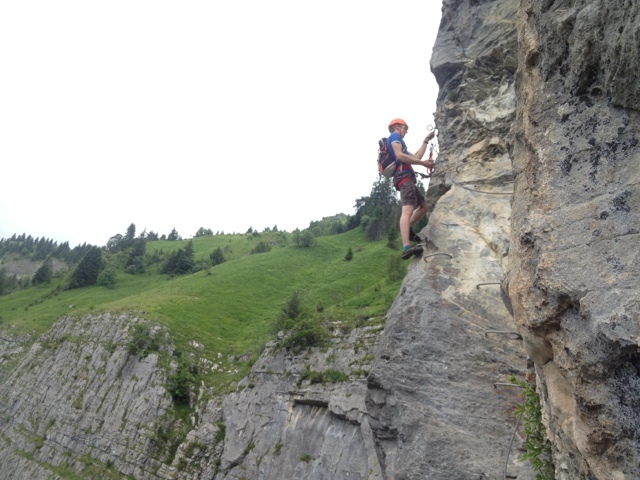 Sure, Dennis and I are both more interested in hard climbing then doing a simple viaferrata but as we were with Dennis brothers we thought it would be a good alternative for sunbathing and swimming at Lac du Passy. Only one of Dennis brothers joined us, Arno. 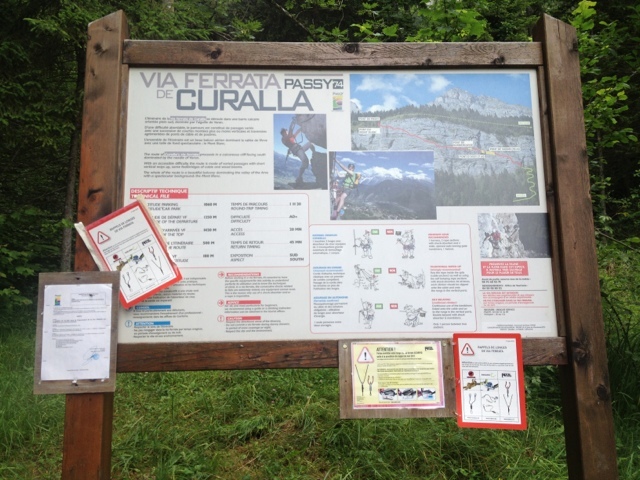 We drove to the Chemin du Curalla to find a marked parking just uphill in a side street. It's supposed to be one of the busiest tours around so we expected loads of beginners. But we were the only ones around. 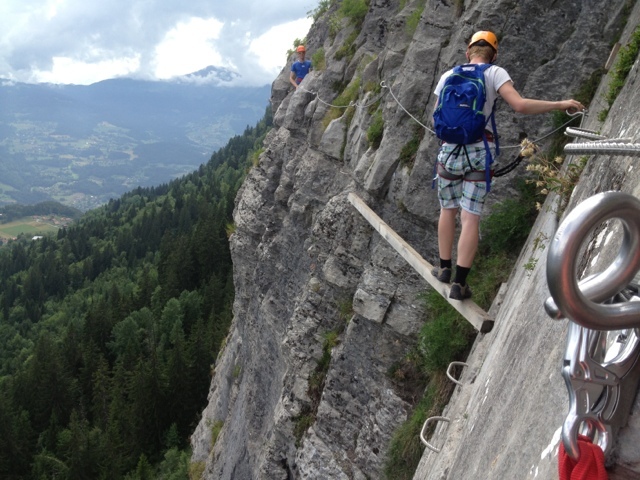 Close to the parking there's a small shop where you can rent viaferrata sets. As we have our own we didn't check the quality. Just want to say that you should be careful and check the safety of your equipment yourself too. 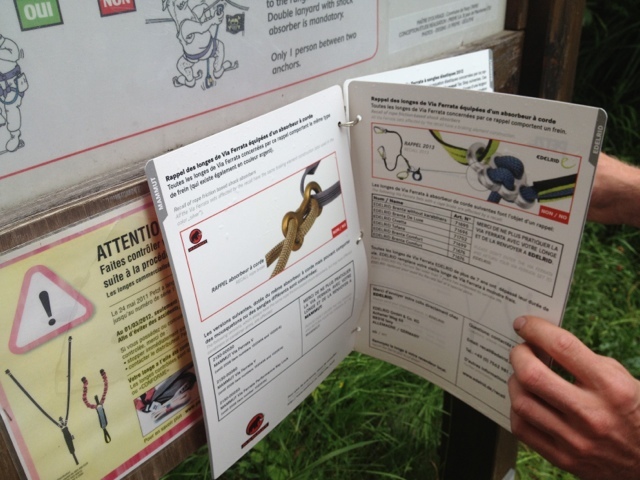 The viaferrata was graded as AD+ which means just two trades harder then the easiest viaferrata in the grading system. 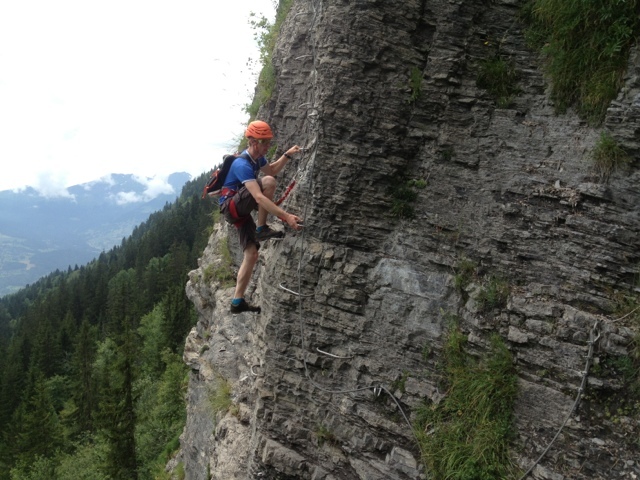 When climbing the first meters we found the steep 'nails' in the wall topically harder then AD+ and Arno found it all pretty scary. We were surprised how well equipped the whole tour was. Perfect over engineered cables, no sharp endings and super solid and and foot placements throughout the whole tour. 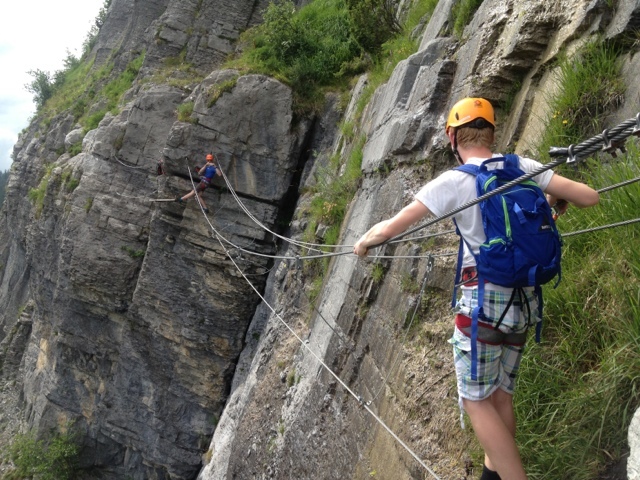 The tour has some great bridges guiding you over a big left going traverse to the top of the cliff. The view, especially with clear weather, is amazing. One of the 4 meter long bridges is called 'Pont du Mont Blanc'. 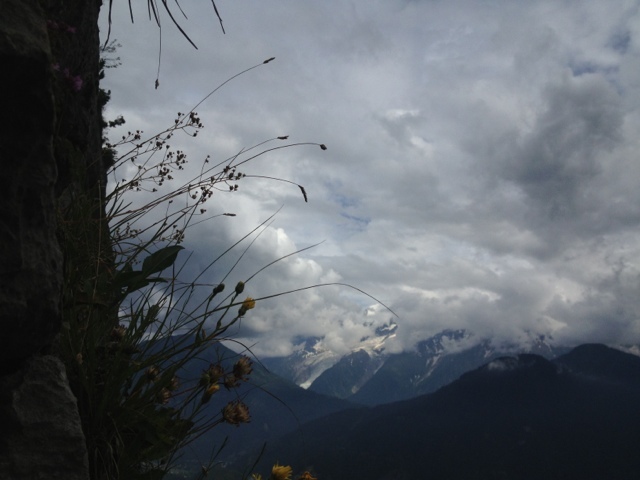 And with a reason; when you look back from that bridge you have a perfect view on the Mont Blanc. 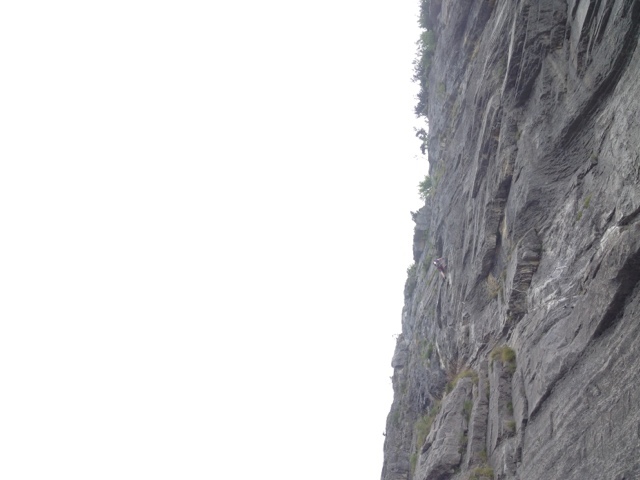 Though, it's a South facing wall on a height of 1400m making it one big 'grill' when climbing t on a Sunny day. Make sure you bring enough water and protection against the sun when you decide to go on a bright mid-Summer day. For an AD+ graded tour I found some sections very 'airy'. 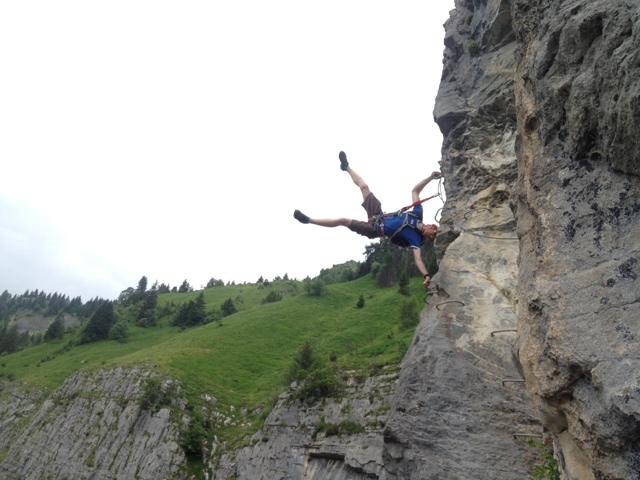 And the sometimes slightly overhanging climbing will be hard when you're less fit. Also children will have trouble clipping the cable as there's quite a distance between the 'nails' and on the 'cable-bridge' the safety-cable is high above your head. That makes it all quite safe, but hard to clip when you're smaller. 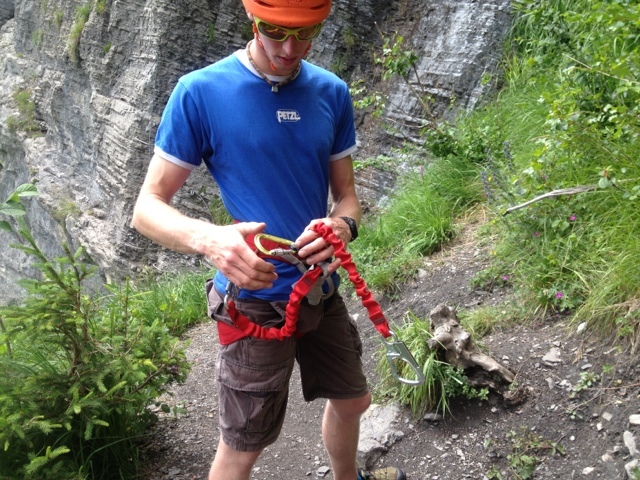 If you're experienced with belaying and the use of a rope on viaferrata's it's possible to use the 'pig-tails' that are secured every three to five meters. 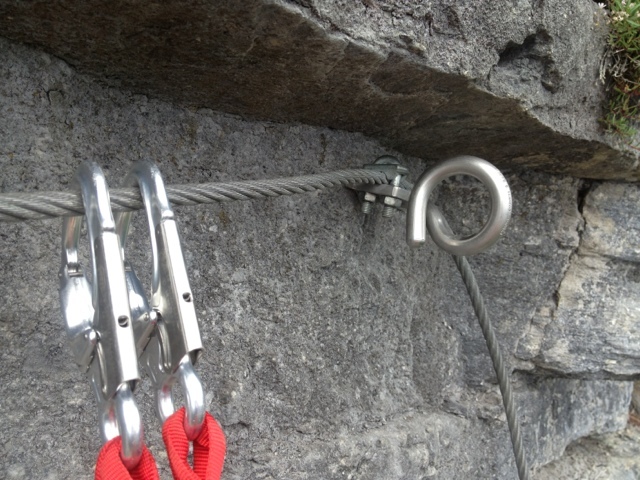 This would make the tour a lot safer and easier for climbers that are smaller and/or less experienced. 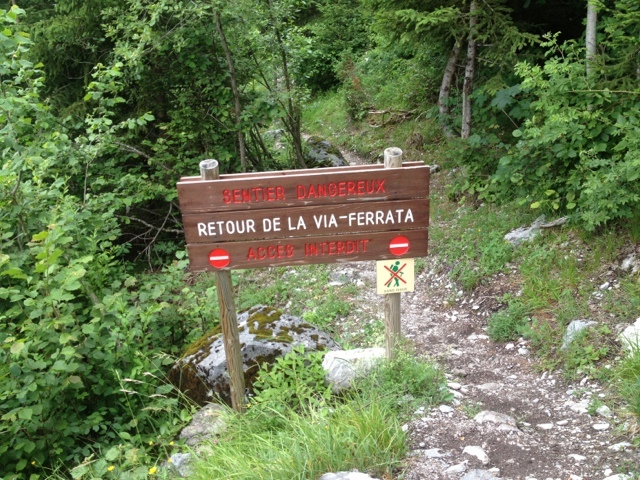 The guidebook said it would take you 1:30 to do the whole climb. We did it in 1:20h. And we're fairly experienced and as the weather wasn't too good we wanted to hurry a bit to be in time before any rain or thunder would hit us. We concluded that an average climber would do the tour in 1:45h or more instead of 1:30h. 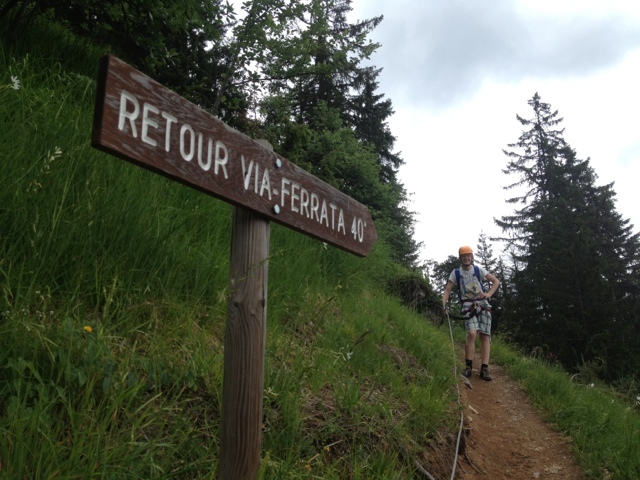 After an 'airy' ending with yet again a small bridge you end up at the top of the plateau. A marked path leads you down to the parking in a 20 to 40 minute hike with some fairly steep down hill sections. All the paths are well maintained especially if you consider it a real mountain-path. After the climb we drove back to Lac du Passy where we went for a cooling swim. A brilliant ending of the day was the pizzeria I can really recommend in the town Sallanches. Super good pizza with Eco-ingredients for a very good price. Only the logo-sign of the place might scar you a bit, but don't worry, really, it's a good place.